Brack, Duncan, and Iain Dale (eds.). 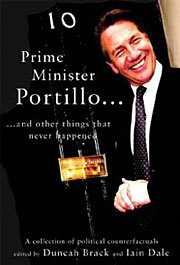 Prime Minister Portillo… and other things that never happened . Politico's 2003. Summary: Collection of 21 speculations, all but two about British politics, including Richard S. Grayson w88 android, Helen Szamuely's "What if Lenin's 'sealed' train had not reached Petrograd in 1917? ", John Charmley's "What if Halifax had become Prime Minister in 1940? ", James Parry's "What if the Liberal Party had broken through from the right? ", Anne Perkins's "What if Gaitskell, not Bevan, had diedin 1960? ", Michael McManus's "What if the Liberal Party had disappeared in the 1950s? ", Simon Burns's "What if Lee Harvey Oswald had missed? ", John Barnes's "What if the Conservatives had won in 1964? ", Robert Taylor's "What if Harold Wilson and the unions had agreed in Place of Strife? ", Greg Rosen's "What if Labour had won in 1970? ", Mark Garnett's "What if Ted Heath had gone to the country three weeks earlier in February 1974? ", Matthew Bailey and Philip Cowley's "What if Ted Heath had stepped down in 1974? ", Paul Richards's "What if Jim Callaghan had gone to the country in October 1978? ", Neil Stockley's "What if Roy Jenkins had joined the Liberal Party in 1981? ", Dianne Hayter's "What if Benn had beaten Healey in 1981? ", Robert Waller's "What if the SDP-Liberal Alliance had finished second in the 1983 general election? ", David Mills's "What if Arthur Scargill had balloted the NUM in 1984? ", Bernard Ingham's "What if Mrs Thatcher had had to resign over Westland? ", Mark Stuart's "What if John Smith had lived? ", Stuart Thomson's "What if Paddy Ashdown had joined the Blair Cabinet in 1997? ", and Iain Dale's "What if Michael Portillo hadn't lost his seat in 1997?". Brack, Duncan (ed.). 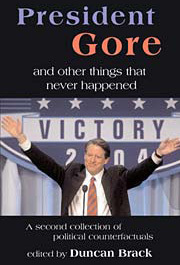 President Gore… and other things that never happened . Politico's 2006. Summary: Collection of 19 speculations, with more about non-British events than its predecessor volume. Includes Mark Pack's "What if the Great Reform Bill had been defeated on its second reading in 1831? ", Matt Cole's "What if Sir Robert Peel had not gone out riding on 29 June 1850? ", David Boyle's "What if Joseph Chamberlain had married Beatrice Webb? ", Tony Little's "What if the Home Rule Bill had passed in 1886? ", Robert Waller's "What if the 1903 Gladstone-McDonald pact had never happened? ", York Membery's "What if Franz Ferdinand's assassin had missed in 1914? ", Jaime Reynolds's "What if Ramsay McDonald had lost the 1922 labour leadership election? ", David Hughes's "What if the liberals had formed the government in 1924? ", Richard S. Grayson's "What if Gustav Stresemann had lived beyond 1929? ", Helen Szamuely's "What if Czechoslovakia had fought in 1938? ", John Gittings's "What if Mao had met Roosevelt? ", Peter Riddell's "What if Britain had entered the common market in 1957? ", Rab Houston's "What if the Scots had voted for devolution in 1979? ", Byron Criddle's "What if President Mitterrand had imposed first-past-the-post instead of proportional representation in 1986? ", Duncan Brack's "What if the alliance had not quarrelled publicly over defence in 1986? ", R.J. Briand's "What if John Major had become Chief Whip in 1987? ", Simon Buckby and Jon Mendelson's "What if Yitzhak Rabin had not been assassinated in 1995? ", Mark Garnett's "What if Michael Howard had become Conservative Party leader in 1997? ", and John Nichols's "What if Al Gore had won the US Presidential election of November 2000?". Summary: Collection of 21 speculations, all but three on British politics and events. Includes David Boyle's "What if Lloyd George and Keynes had gone to Russia in 1916? ", Robert Waller's "What if proportional representation had been introduced in 1918? ", Jaime Reynolds's "What if Lloyd George had done a deal with the Tories in 1931? ", Ted Morris's "What if Attlee had sent Dalton to the Foreign Office and Bevin to the Exchequer in 1945? ", Neil Stockley's "What if Richard Nixon had become President of the United States in 1961? ", Mark Stuart's "What if Harold Macmillan had not resigned in 1963? ", Richard Briand's "What if the UK had never joined the EEC? ", Sam Cannicott's "What if Rupert Murdoch had not bought The Times in 1981? ", Adrian Moss's "What if Mrs Thatcher had settled with the miners in 1984? ", Graham Kirby's "What if Margaret Thatcher had won the 1990 Conservative leadership contest? ", Christian Walker's "What if the coup against Gorbachev in 1991 had succeeded? ", Peter Riddell's "What if Gordon Brown had stood for the Labour leadership in 1994? ", Tony McNulty's "What if the United Kingdom had not gone to war in Iraq in 2003? ", Iain Dale's "What if David Davis had been elected leader of the Conservative Party in 2005? ", Jane Griffiths's "What if Tony Blair had remained as Prime Minister? ", Philip Cowley's "What if Gordon Brown had called an election in 2007? ", David Bean's "What if Hillary Clinton had secured the Democratic nomination in 2008? ", Matt Cole's "What if Harris and Marris had won in 2010? ", David Mills's "What if Nick Clegg had opted for `confidence and supply' rather than full coalition in 2010? ", and Andy Mayer's "What if Pope Benedict had been assassinated on his visit to Britain in 2010?". as well as the non-allohistorical Mark Munro's "What if Ken Livingstone wins the 2012 London mayoral election?"